The 2013 spring turkey season in Kansas was incredible for me. I was fortunate enough to tag out on opening day, with a right-off-the-roost gobbler in the morning and a paintbrush-bearded strutter in the evening. It was the first time I had limited out in one day, much less on opening day. And to top it off, both of those birds were shot with a bow. Bowhunting for turkey can be a challenging, yet rewarding experience. There is something special about taking a turkey with a bow. Perhaps it’s the primitive style of hunting; done similar to the way Native American Indians did it many moons ago. Or maybe it’s the extra challenge required to draw a bow on a wary tom without being detected. Whatever the reason, bowhunting is one of my favorite ways to wrap a tag around the leg of a longbeard. Something you may want to consider when bowhunting for turkey is lowering your draw weight. Most states have very lenient restrictions on minimal draw weights for turkey (check with your state wildlife agency). Sixty to seventy pounds may be ideal for crushing through the thick skin and hard bone of a whitetail deer. However, for turkey, tricep-tearing draw weights just aren’t necessary. I have found the ideal draw weight to be around 40-45 lbs. That is plenty of speed and kinetic energy to effectively pass through a turkey. Another major advantage to a lower draw weight is the ability to hold at full draw longer. Unlike deer, turkeys can turn on a dime. They can move from a great shot to a bad one in a split second. Keeping your draw weight down to a minimum will help keep you at full draw long enough to wait for the perfect shot. With a bow, shot placement on a turkey is critical. The vital area on a turkey is about the size of your fist. Compared to a deer, that is an extremely small target. There are several shot angles that a hunter can choose from when bowhunting turkey. Two of them, however, can be very effective. The first is a non-strutting, broadside shot. When a turkey is in this position, your aiming point is right above where the leg meets the body. This shot will take out the tendons of the legs, preventing the bird from running away after the shot. It greatly increases the odds of recovering your turkey once it has been hit. Turkey have over 5,000 feathers to absorb blood, making it next-to-impossible to follow the blood trail of an arrowed turkey. The broadside shot will likely break a wing and/or pierce the heart and lungs as well. Another shot I like to take is the facing away, spine shot. A shot anywhere in the spine will completely immobilize the bird. Your aiming point for this shot is anywhere from the back of the head to the base of the tail. The eyesight of a wild turkey is amazing. It is the primary way they survive against predators. Turkey can see up to 10 times better than humans. They have a field of view of nearly 300 degrees, and can also distinguish colors. There lies the challenge in hunting turkey in general. Add to that the fact that you have to hold a big, bulky bow at full draw without being seen, and you are in real trouble … unless you are concealed well. For this reason, I am a big fan of using pop-up style blinds for bowhunting turkey. They are light, easy to carry and set-up quickly. Pop-up blinds also give you plenty of room to adjust for the shot, come to full draw, and release an arrow without being detected. Unlike deer, turkey don’t seem to mind a pop-up blind being set-up the morning of the hunt. They will usually walk right by it as long as they don’t pick up on any sound or movement. If a pop-up blind isn’t available, building a natural blind out of tree limbs can work well too. Decoys are a near-necessity when bowhunting turkey. A decoy gives the approaching longbeard an incentive to come into bow range. It also serves as a distraction while you draw your bow. When bowhunting from a pop-up blind, I like to set up my decoys at 10-12 yards. This is the perfect distance for a bow shot on turkey. The direction you face your decoys is also very important. A tom will most likely try to square off face-to-face with another tom or jake. For this reason, you want to position your tom/jake decoy facing toward you. When a gobbler approaches the decoy, he will be facing away from you. This gives you the opportunity to draw on him without getting busted, especially if he is fanned out. Since a gobbler will approach a hen from behind, set up your hen decoy facing away from you. 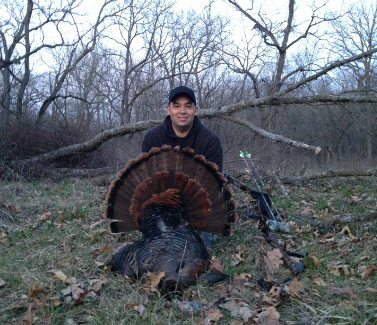 When it comes to broadheads for turkey, bigger is better! Mechanical broadheads are ideal for several reasons. First of all, once they expand, mechanical broadheads are generally wider than fixed broadheads. They also lack the bone-crushing power of a fixed broadhead. Remember, you don’t need as much power to go through a turkey as you do to go through a deer. Secondly, more of the arrow’s energy is transferred to the bird with mechanicals than fixed blades. There are several broadheads on the market today made especially for shooting at a turkey’s head/neck. While these types of shots make for some really cool videos, I am not a big fan of them. A turkey’s head is almost always moving. You will likely be aiming at a moving target and, therefore, decrease your odds of hitting the bird. We turkey hunters remember every turkey we shoot. We love to tell the story of the hard work, dedication and (sometimes) luck it took to bag each bird. Hopefully, these tips will help you create some new memories as you hit the woods this spring with bow in hand. Korby Taylor is the host of the popular hunting podcast called The Wild Game Hunting Podcast. The Wild Game Hunting Podcast is an informative and entertaining free hunting show published once a month. Each episode offers listeners hunting tips from professional hunters, a lesson from the field, hunting updates from the host, and plenty of good 'ole hunting stories! Korby was born and raised in North Texas and now lives in the Dallas/Fort Worth area with his wife and two kids. He loves to hunt anything, but especially likes pursuing Spring Turkey and Whitetail Deer.